Q. What is the Alien Skin Software Affiliate Program? A. It’s a way of driving sales of our products by inviting photographers and designers to promote our products and spread the word, and rewarding them for doing so. Our affiliates are rewarded with each sale that their promotion helps make happen. We’ll share 15% of each sale that comes from an affiliate’s link or coupon code within 45 days. Q. What qualifications do I need to sign up? A. You should be a photographer or graphic artist and be using at least one of our products to edit your work. If you haven’t used our products before, download a free trial of either the Exposure X4 Bundle or Eye Candy 7, and begin using them to create beautiful images or designs. It helps if you have an established audience that is engaged in the content that you share. But don’t worry, you don’t have to be a superstar with hundreds of thousands of followers to make money. If you have an engaged audience, you can succeed in this program. Q. What are my responsibilities as an affiliate? A. To adhere to our terms and conditions, and to promote our products, sales, free trial signups, and other marketing activities as much as you like using the supplied links on your website, email, or posts. Q. Can I become an affiliate if I live outside the United States? A. Yes. We accept affiliates from anywhere in the world, as long as our affiliate management system supports your country of residence. Please note that commission payments are currently made via PayPal. Q. How do I know if my application has been received or if I have been accepted into the affiliate program? A. We’ll contact you within five working days of your application. Q. Can I offer my audience a discount on your products? A. We are happy to offer short-term discount codes for courses or workshops, and longer-term codes for videos that educate your audience about Exposure. Please get in touch with us at affiliate-program@alienskin.com with the details of your event(s) to request a discount code. Q. Do I get free software for being an affiliate? A. Because our affiliate program is open to anyone who wants to join, we do not offer free software to affiliates upon joining the program. When we release a new version of our software, affiliates with at least $200 in sales in the previous 12 months will receive a free copy. We provide license codes to influential educators and members of the media through our PR outreach. For more information about that, contact us at press@alienskin.com. Q. How should I describe your products to my audience? Bring your creativity to life with Exposure, the award-winning non-destructive RAW editor and organizer. Fast performance, unmatched creative editing, and powerful organizing tools enable you to create gorgeous images and master your workflow. Exposure provides you with hundreds of customizable creative looks that reproduce the look of analog film, and go even further by offering new creative styles. There are many powerful editing tools and special effects you can use to easily achieve your own unique look. Fast, reliable performance and an intuitive user interface help keep you in the creative zone. Robust organizing tools make it easy to find your favorite images, compare different edits, and organize your photo library. Use Exposure as a complete photo editor or as part of your Lightroom or Photoshop workflow. Learn more on the Exposure product page. Ever wanted an easy way to transform your photos into realistic oil paintings? With Snap Art, now you can. You don’t need a degree in painting to achieve beautiful, realistic-looking natural media effects. Choose from presets that simulate oil painting, watercolor, crayon, and pencil sketch. You control the intensity of the look. The end result is a work of fine art that’s suitable for framing and hanging on the wall. It’s also a great value add for your commercial photography business, enabling you to offer clients a product that your competition cannot. Learn more on the Snap Art product page. Blow Up is your go-to app of choice for image enlargements. Whether you are enlarging a large print for hanging on the wall or “rescuing” low-res JPG images for enlargement when the original RAW file cannot be found, Blow Up provides you with unmatched quality. Images are sharp and free from computer artifacts, the enlarging process is simple, and up to 300,000 pixels per side is supported. Blow Up is the best solution for photographers and graphic designers who need to enlarge their photos without compromising on image quality. Learn more on the Blow Up product page. The Exposure Bundle integrates Exposure, Snap Art, and Blow Up. It’s the best way of putting all of Alien Skin’s award-winning photo editing apps at your fingertips. It offers the best value, too. For graphic designers looking for a fast, creative way of adding realistic-looking effects to their designs, Eye Candy is the obvious choice. Fire, chrome, lightning, animal fur, and smoke are just a few of the 32 effects categories. Eye Candy’s intuitive interface enables you to visually explore effects and design your own. Learn more on the Eye Candy product page. You can also download these product descriptions as a PDF document. A. Not a penny. Your only investment is product knowledge and posting enthusiastic, engaging content that informs about and promotes our products, sales, free trial signups, and other marketing initiatives. Q. Is there a limit on what I can earn? A. There’s no limit to what you can earn. Your profits are based on how many sales you help create. Q. When do I receive my commission payment? A. You’ll be paid on the 10th of every month where your commission balance exceeds $50. A. Payments are sent exclusively via PayPal. Q. Are my affiliate sales and my coupon code connected? A. Yes. Coupon codes are another way of tracking affiliate sales. Links are a good method because of how easy they are to use. Coupon codes are useful in situations where a link is problematic, such as an in-person class or a video. We’ll provide coupons upon request for specific situations where links don’t work (classrooms, videos, etc.). A. We pay a 15% commission rate for customer purchases. This covers both new and returning customers. Q. Is there a minimum annual threshold? A. There is no minimum amount required to remain in the program, but you’ll need to have at least $50 in your account to receive a payment. Good news: selling a single product will get you there. Q. Do I earn commission credits if someone clicks on a product on my site and then buys a different product? A. Yes. You will receive full credit for any product that is purchased by a customer who clicks on your affiliate link across alienskin.com. Q. What sales and revenue reports do you provide? A. You can generate a report that you’ll receive in your email. It provides a record of your clicks, conversions, revenue, commission, last conversion, and last payment. Q. How does the affiliate program know when I should receive credit for an order? A. When someone clicks a banner or text link with your affiliate information, their visit is recorded our affiliate management system. If they decide to purchase within 45 days, our online store notices that they visited through your link and credits you with a commission. Q. How do I manage my affiliate account? A. Simply log into https://alienskin.refersion.com/affiliate/login and use the account management tools there. Q. How do I keep track of how much I’ve earned? A. You’ll find that info on your affiliate account page. Q. What if I forgot my Affiliate program password? A. Click on the ‘Forgot Password’ link at the bottom of the affiliate login page to have your password sent to your email address. Q. After I join the Alien Skin Software Affiliate program, where do I get the links to put on my website? A. You’ll find them in Dashboard section of your affiliate account. The link in the ‘Your Link’ box will lead to the Alien Skin Software home page by default. If you’d like to create a link to another page on our site, click the ‘Click link to a specific page’ option at the bottom. Then paste a specific link on our site (a blog post, our store, a free trial page, etc.) to create a custom link that appends your rfsn number to the end of the link. Note that link shortening options are available. Q. Where should I place the Alien Skin Software affiliate links on my website? A. Place them wherever you’d like to. Q. How do I create affiliate links? A. You’ll find your affiliate link in the Dashboard section of your affiliate account. The link leads to the Alien Skin Software home page by default. If you’d like to create a link another page on our site, click the Create link to a specific page link at the bottom. Enter the url for the page in the window and then click the Create Link button. A new window will come up with the tagged affiliate link. Click Copy to copy it to the clipboard, or use the share buttons to share with your followers via email or social network. Q. How do I embed banners? A. We provide ad banners for our products which you can embed on your website. Clicking these banners works just like clicking affiliate links. You’ll find these banners in the Creatives section of the affiliate portal. 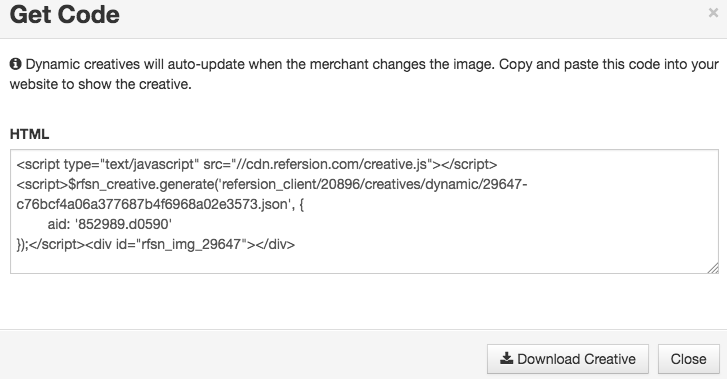 Click the creative graphic to open the Get Code dialog. Then copy and paste the code into your website’s HTML design. You can also add these graphics to an email you’re sending to your audience. Click Download Creative and then place the graphic in your email. Then assign your affiliate link as a hyperlink on the graphic. Q. If I have multiple websites, do I need to apply separately for each? A. Nope, once is fine. Just list all of your websites on your application and then promote Alien Skin Software on them once you’re an affiliate. Q. I don’t have a business site, and don’t want to put banners on my site. Can I still be an Alien Skin Software affiliate? A. Yes, you can promote affiliate links in emails or newsletters, or on social media. If you teach classes, create videos, or otherwise are in a situation where links won’t work, contact us to request a coupon code that tracks affiliate sales. Q. Can I use images from the Alien Skin Software website and social media on my websites? A. All of the materials in the affiliate portal can be used for promotion. If you wish to use other material on our site, please contact us to request permission. Q. How many links should I place on my website? A. There’s no minimum or maximum amount. It’s best not to go overboard with them so your audience doesn’t think you’re spamming. Q. What if I already know HTML and need some advanced help linking? A. We’re happy to help. Contact affiliate-program@alienskin.com for more information. Q. I still have questions. Can I contact you? A. Sure thing. Contact us at affiliate-program@alienskin.com.